For running with the DIY punk scene, Vacation are surprisingly diverse (not to mention prolific). 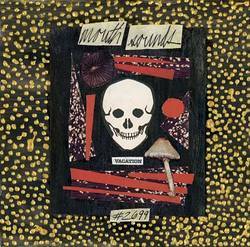 The band’s latest is the 12-song Mouth Sounds #2699 and its 26-minute span delivers the band’s general sound of fuzzed out garage-punk bangers, but within that general sound they deliver crunchy grunge riffs, pop melodies, and flat out noisy bursts, all within a short-song framework that rarely tops 3-minutes per song. Nothing on Mouth Sounds #2699 sounds the same, yet it all sounds like Vacation. The band’s melodic base feels built on a sunny California-style rock that’s layered with feedback and thick riffs to give a heaviness built atop the sing-song rhythms. The closing track “A Lap as Ken Worthy” is a sufficient example of their primary sound. It’s a pop song at heart with fuzzy guitar and some subtle shifts in dynamics that push the tone into a cloudier realm than its music sheet would suggest. After a singalong chorus, they chop it up at the 2-minute mark with a sudden break in the action that grinds the record to a halt instead of circling in that melodic joy. On the other end of their songwriting comes a song like “Broken or Breaking.” It starts out with a wave of feedback then chugs through some repetitive riffage and comparable vocals that should sound droning but have a rough heart that cuts through the redundancy. There is also “My Fake Life,” a stripped-down jam, in this case entirely without percussion. It’s equally discordant, noisy, and heartfelt, a twisted take on pop balladry that’s all heart without the drama of full instrumentation. “Born on a Bass,” “Deflector Head,” and “Epileptic Soul” all share that pop wonder, countered by others, like “Leisure Miles” which is fast and angry with that spit in your eye r ‘n’ r energy. You can even get a feel for the band by their song titles: "Action Road", "Broken or Breaking", "Take Out the Trash", "Skyline", "Deflector Head". There’s action and there’s a core subject, sometimes with an everyday doldrum touch. The songs are relatable but with an unexpected element. At times it gets a little repetitive as the band builds on that foundation, but Vacation as a whole is writing some of the best anti-pop songs around. Posted Aug. 20, 2018, 6:36 p.m.
Posted April 17, 2014, 3:27 p.m.